Nature routinely presents us with spectacular demonstrations of organization and orchestrated motion in living species. 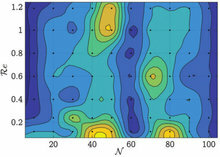 Efficient information transfer among the individuals is known to be instrumental to the emergence of spatial patterns (e.g. V-shaped formations for birds or diamond-like shapes for fishes), responding to a specific functional goal such as predatory avoidance or energy savings. Such functional patterns materialize whenever individuals appoint one of them as a leader with the task of guiding the group towards a prescribed target destination. It is here shown that, under specific conditions, the surrounding hydrodynamics plays a critical role in shaping up a successful group dynamics to reach the desired target.